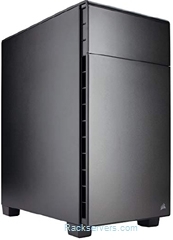 Description Corsair Carbide Quiet 600Q Full Tower. Advanced PC ATX chassis. 2x 5.25" External bays, 3x 2.5" Internal HD/SSD bays, 2x Internal 3.5" HD bays. Advanced low noise system cooling. High efficiency PSU options from 650W to 1600W.